TCDSU held a town hall this evening to gauge students’ views on the campaign for higher education funding. Trinity College Dublin Students’ Union (TCDSU) this evening appealed to students for their views on the future of the campaign for higher education funding, with divisions emerging between those calling for a single-issue education campaign and those arguing for a wider social movement encompassing housing. 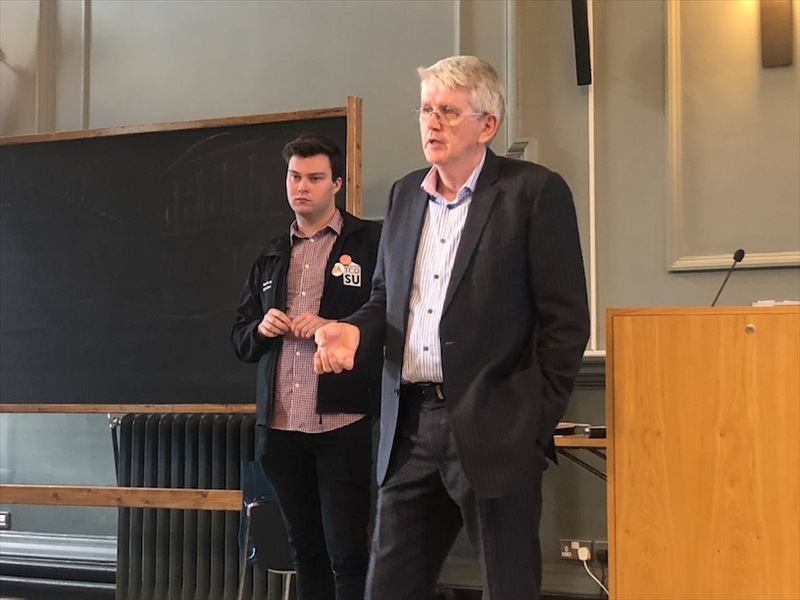 With Director General of the Irish Universities Association (IUA) Jim Miley in attendance, the town hall meeting, organised by TCDSU, saw more discord than consensus on how best to tackle the issue of higher education funding. Around 30 students heard from activists of both stripes, with some stressing the value of a “holistic” approach, while others called for immediate and drastic “escalation” of the campaign. Miley appealed to those present to recognise the common interests of universities and students. Miley said that while the IUA and students may not agree on “particular policy aspects”, increased state investment is something that both bodies should fight for. Miley came to speak to students about universities’ recently launched Save Our Spark campaign, which encourages the public to sign an online petition and contact their local politicians to demand answers on higher education funding. Miley hopes to reach 1,000 signatures by the end of the week. Miley was quizzed by students on several aspects of IUA policy. Conchúir Ó Raidaigh, a leader of Take Back Trinity and a member of the Take Back the City housing group, asked about the link between the IUA and Ibec, the largest business lobby group and largest lobbying organisation in Ireland. He also questioned why the IUA wasn’t campaigning for a full restoration of the peak funding given to universities. After criticising the response of USI to Budget 2019 last week, TCDSU President Shane De Rís said this evening that “the purpose of this town hall isn’t to rehash this problem, but to brainstorm actions we can take going forward”. He said that students need to “make sure people are listening and looking”. Ó Raidaigh criticised USI’s recent decision to focus its annual march on the housing crisis rather than on higher education funding. He urged that a replacement march for education take place later on the year. “We need to be centring ourselves on the streets”, he said. A bloc of student activist groups – including Take Back Trinity – will hold a day-long meeting to tackle higher education issues in University College Dublin (UCD) on Saturday. Donal MacNamee and Eleanor O’Mahony also contributed reporting to this piece.